Siege is an HTTP/HTTPS stress tester. Siege is a multi-threaded http load testing and benchmarking utility. It allows one to hit a web server with a configurable number of concurrent simulated users. Performance measures include elapsed time, total data transferred, server response time, its transaction rate, its throughput, its concurrency and the number of times it returned OK. These measures are quantified and reported at the end of each run. Their meaning and significance is discussed below. Siege has essentially three modes of operation: regression (when invoked by bombardment), internet simulation and brute force. HELP, prints the help section which includes a summary of all the command line options. VERBOSE, prints the HTTP return status and the GET request to the screen. Useful when reading a series of URLs from a configuration file. This flag allows you to witness the progress of the test. GET, pull down HTTP headers and display the transaction. Great for web server configuration debugging. Requires a URL be passed to siege on the command line. CONCURRENT, allows you to set the concurrent number of simulated users to num. The number of simulated users is limited to the resources on the computer running siege. INTERNET, generates user simulation by randomly hitting the URLs read from the urls.txt file. This option is viable only with the urls.txt file. DELAY, each siege simulated users sleeps for a random interval in seconds between 0 and NUM. BENCHMARK, runs the test with NO DELAY for throughput benchmarking. By default each simulated user is invoked with at least a one second delay. This option removes that delay. It is not recommended that you use this option while load testing. REPS, allows you to run the siege for NUM repetitions. If --reps=once, then siege will run through the urls.txt file one time and stop when it reaches the end. NOTE: -t/--time takes precedent over -r/--reps. If you want to use this option, make sure time = x is commented out in your $HOME/.siegerc file. TIME, allows you to run the test for a selected period of time. The format is "NUMm", where NUM is a time unit and the "m" modifier is either S, M, or H for seconds, minutes and hours. To run siege for an hour, you could select any one of the following combinations: -t3600S, -t60M, -t1H. The modifier is not case sensitive, but it does require no space between the number and itself. LOG transaction stats to FILE. The argument is optional. If FILE is not specified, then siege logs the transaction to SIEGE_HOME/var/siege.log. If siege is installed in /usr/local, then the default siege.log is /usr/local/var/siege.log. This option logs the final statistics reported when siege successfully completes its test. You can edit $HOME/.siegerc to change the location of the siege.log file. MARK, mark the log file with a separator. This option will allow you to separate your log file entries with header information. This is especially useful when testing two different servers. It is not necessary to use both the -m option and the -l option. -m assumes -l so it marks and logs the transaction. If the MESSAGE has spaces in it, make sure that you put it in quotes. HEADER, this option allows you to add additional header information. -A "User Agent", --user-agent="User Agent"
AGENT, use this option to set the User-Agent in the request. HELP, prints the help section which includes a summary of all the command line option. CONFIGURATION, prints the current configuration in the $HOME/.siegerc file. GET, pull down HTTP headers and display the transaction. Great for web server configuration debugging. Requires a URL be passed to siege on the command line. Here in this example you can get tons of informations which is useful when you making report for the client . BENCHMARK, runs the test with NO DELAY for throughput benchmarking. By default each simulated user is invoked with at least a one second delay. This option removes that delay. It is not recommended that you use this option while load testing. Your log file is stored in var directory . 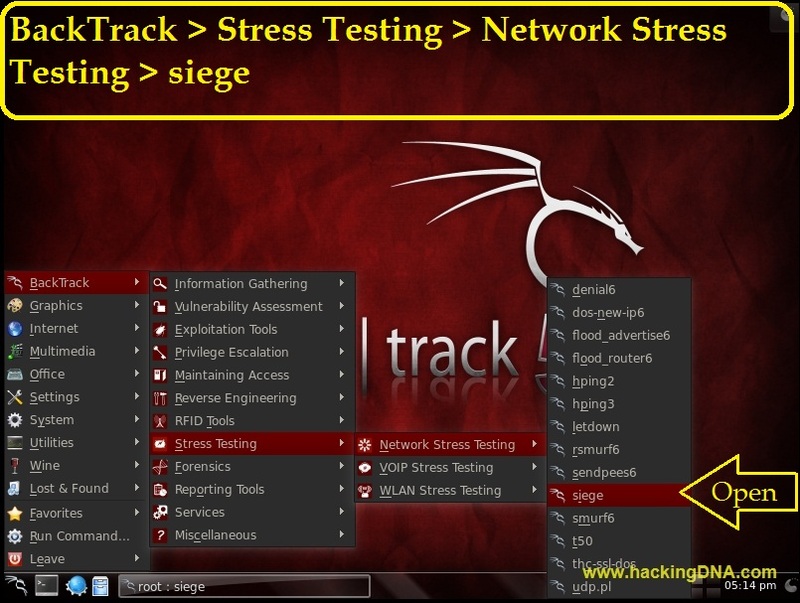 THIS IS HOW WE CAN USE SIEGE IN BACKTRACK 5 . ALWAYS REMEMBER USE THIS TOOL FOR EDUCATIONAL PURPOSE ONLY , DOING A ATTACK IS ILLEGAL ,YOU YOURSELF RESPONSILE WHILE USING THIS TOOL .